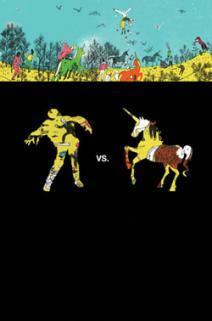 Zombies verses unicorns. A war (among many) that is being waged right now on the internet. I say that because I sadly only learned of the war about ten days ago with the book, Zombies vs. Unicorns. This annoys me to no end because I would have thrown my hat into the ring for Team Zombie the moment the war started if I had known, so I’m making up for it now. The stories are great. There’s some serious stories, some comedies, and some that make you stop and do a mental double-take. Plenty of surprises in them I’d LOVE to spoil for you (but won’t). For those who hate the classic zombies (you should be ashamed), not all the zombie stories are about ends of the world or mindless monsters (but on the other hand there are some present of those as well). For Team Unicorn I must admit I am biased against them…. though I have to say this: only one story had a rainbow farting unicorn. In fact, they weren’t that bad, despite their story topics. I must say my favorite unicorn story was by far “The Care and Feeding of your Baby Killer Unicorn”, for obvious reasons. Plus, it’s easily organized so you can avoid a side’s stories if you want. On top of the stories, the intro has a nice comment section/war between the leaders of Team Zombie (Justine Larbalestier) and Team Unicorn (Holly Black) that sets a nice tone for the book and continues in the intro of each story. All in all, this is an essential read if you feel you support zombies or unicorns, or if you just like to read great stories by some great authors.